I thought I would post the statement I had written for Koplin Del Rio Gallery on the Tattoo Machine Breadbox series that I have been working on over the years. I had shown several of the Bread boxes in a group show. The gallery thought it would be fitting to write a statement on my process and inspiration behind the Tattoo Machine Breadbox series. I will be listing these pieces very soon in my online store. I hope you will enjoy the story behind them, as it has been a process that has brought me great joy. I began building memento boxes some time ago. Perhaps it was my mother’s influence on me as a child, when she would construct these elaborate shadow boxes with childhood keepsakes and lovingly place them throughout the house. The shadow boxes were like one’s own personal history or time capsule. They were a way to cherish the trinkets and reminders we held so dear. Fast forward to my adult years, my first real job was as a body piercer in a tattoo shop in Pasadena, CA. When I was in high school, I became so fascinated by tattoos and piercings that it was the majority of what I thought about. I was consumed by the idea of transforming one’s body into a personal gallery. During my years as a piercer, I was able to connect with people in a very unique way. Piercing opened up spiritual portals, creative floodgates and allowed me to dive deep into my own psyche. Also during this time, I had the opportunity to befriend some great tattoo artists that I consider dear friends to this day. I had two friends in particular whom I credit for inspiring the Tattoo Breadbox Series: Dan Dringenberg and Karl Marc. I knew Dan and Karl independently of each other. Both were tattoo artists and tattoo machine builders. Dan Dringenberg was the sort of person who was born to tattoo and build tattoo machines. His love for the tattoo industry was like a heartbeat. When Dan spoke, you felt as though you had been living your life asleep and he was there to wake you up from your slumber. His dedication and drive inspired you to work harder and earn your place in whatever industry you were working in. 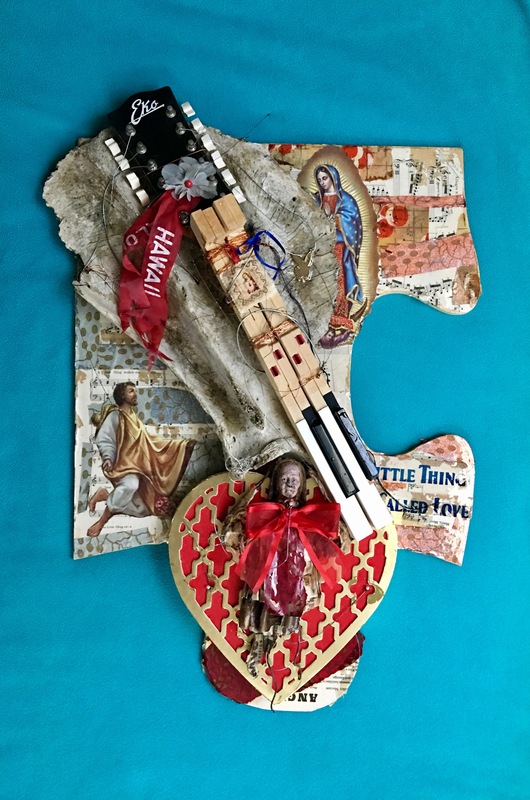 Dringenberg had seen my assemblages and collages over the years and was always excited to see what I was conjuring up. It was Dan who had put the bug in my ear to build tattoo machine cases. “Jolly Roger” made from an antique medical cabinet. The first of the Tattoo Machine case. As seen in the book “Hand Made” by Karl Marc. Karl Marc was someone I worked with at the shop, and he too, was constantly creating. Karl would tattoo and paint all day, and build machines when he wasn’t tattooing. I would sometimes go over to his workshop and he would show me the latest machine he was building. One day, he decided to put together a book of tattoo artists and the tattoo machines they made. I was so excited by his project that I couldn’t resist building a case that could hold tattoo machines in a very precious way, almost like a tabernacle. Karl loved the cabinet and decided to give me a place in his book, “Hand Made” as well as show it in the exhibit that coincided with the book’s release. When Karl decided to do a second book, he asked me to help him with putting together the roster, as well as finding a bigger gallery in Los Angeles to show the new line up of “Hand Made” artists. That was when I did a second cabinet, but this time from an old breadbox. “Davy Jones,” the second piece in the Tattoo Machine breadbox series. Featured in “Hand Made, Volume II” by Karl Marc. I chose the breadbox for a few reasons: The breadbox is a common household item that could easily store multiple machines. Oftentimes, breadboxes have glass in the doors, so you can easily see the contents inside. Lastly, and most importantly, the tattoo machine is vital to the tattoo artists’ craft. The machine is the means to earning their living, aka their dough, their “bread.” The amount of care and craftsmanship that goes into building a solid tattoo machine is a work of art in itself. Being that so much love is put into building a great machine, it only seemed logical to hold them in a beautiful place that paid tribute to the importance of these sacred instruments. Tattoos are associated with sailors, pirates and mermaids in seaport towns. 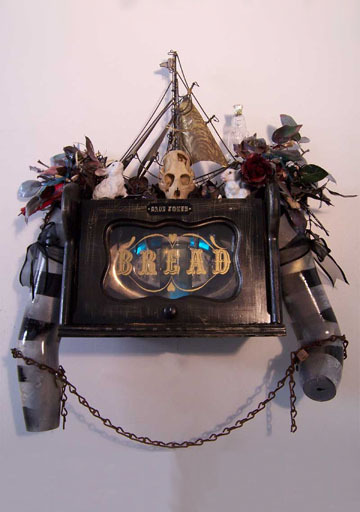 Thus, seafaring and oceanic elements are reoccurring themes in the breadbox series. The name “Davy Jones” refers to the spirit that inhabits the depths of the ocean floors. There is a real monkey skull affixed to the ship, which is a reference to the late Davy Jones, singer of The Monkees. There are bunny rabbits on top, which allude to the novel “Watership Down.” The inside of the box lights up, and contains a tattooed shark specimen that adds to the mythology associated with the piece, as well as guards the contents of the box. “Black Pearl,” was inspired by the infamous pirate’s ship in the “Pirates of the Caribbean” series. 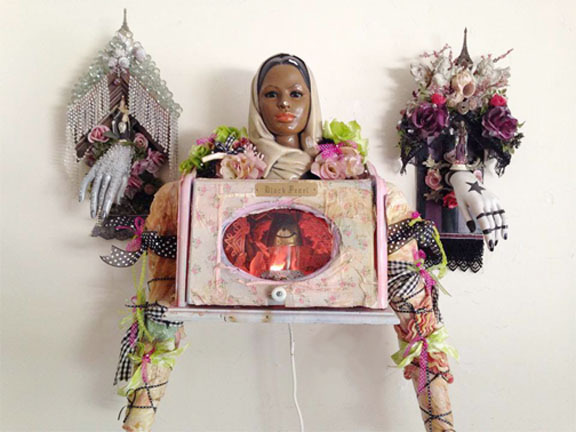 Pearl’s appendages are flanked with seashells, baubles and bones. 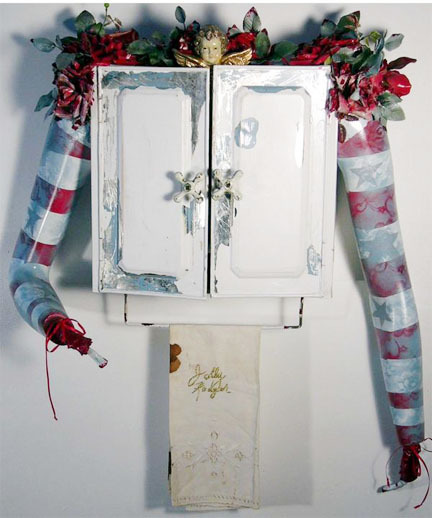 Her insides also light up, and contain the specimen of a pig fetus in formaldehyde, which is a nod to the proverb of “casting pearls before swine.” “Jolly Roger,” “Davy Jones,” and “Black Pearl” are personified assemblages that pay homage to ocean lore and myth. “Black Pearl” Tattoo Machine case triptych. I am still in love with tattoos. I’m still fascinated by tattoo machines. I still spend time in tattoo parlors and machine shops. And I still have an unshakeable respect for the people in the tattoo industry that are wholeheartedly committed to making beautiful tattoos… These cases are dedicated to you. We’ve all heard the adage “It’s better to be late, than never at all,” and I know it has been several months after the fact, but I have been wanting to share more on the “Piece by Piece” show which took place back in April. I thought it would be fun to show my individual process, along with the vision of the show itself, which was curated by dear friend, Tim Shelton. 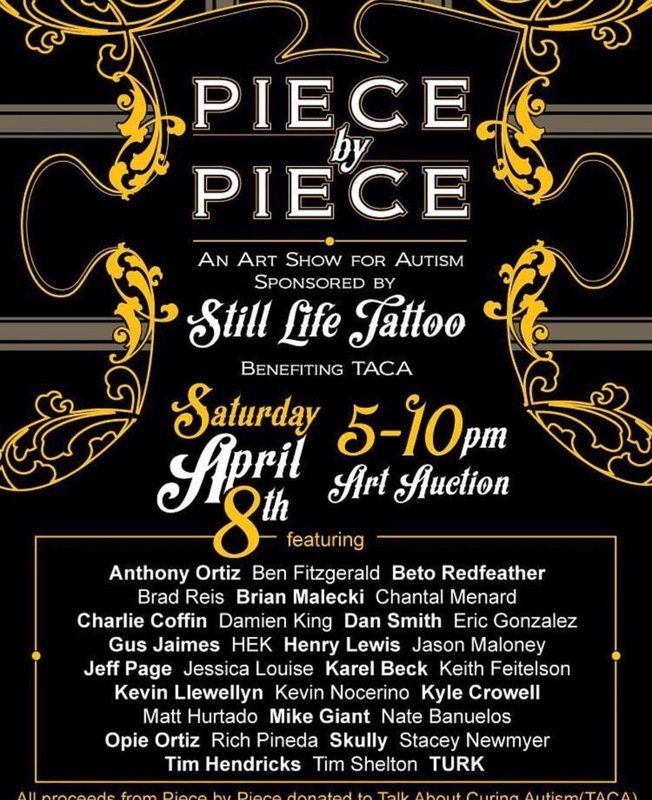 On April 8th, 2017, Still Life Tattoo hosted an incredible benefit for Autism. 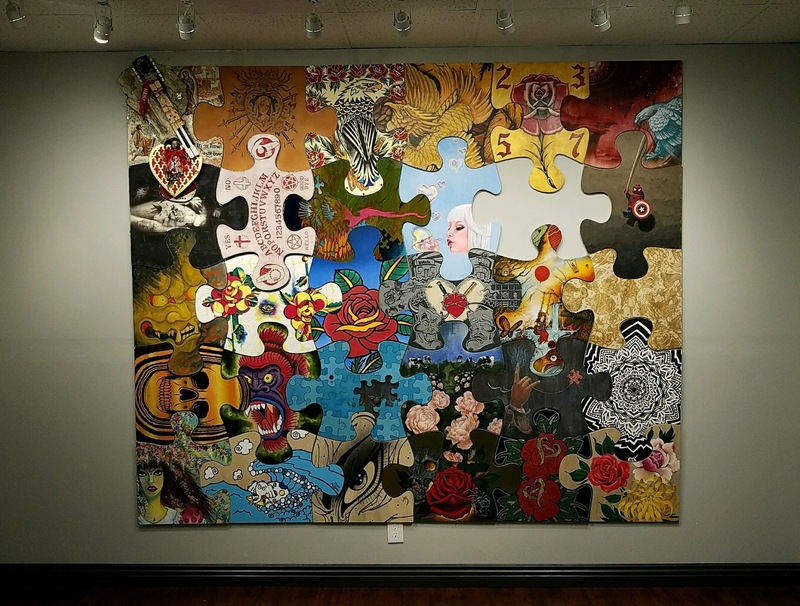 The Name of the Show was called “Piece by Piece.” All of the artists involved were given a blank puzzle pieces and asked to create an original piece of artwork on this puzzle piece-shaped canvas. 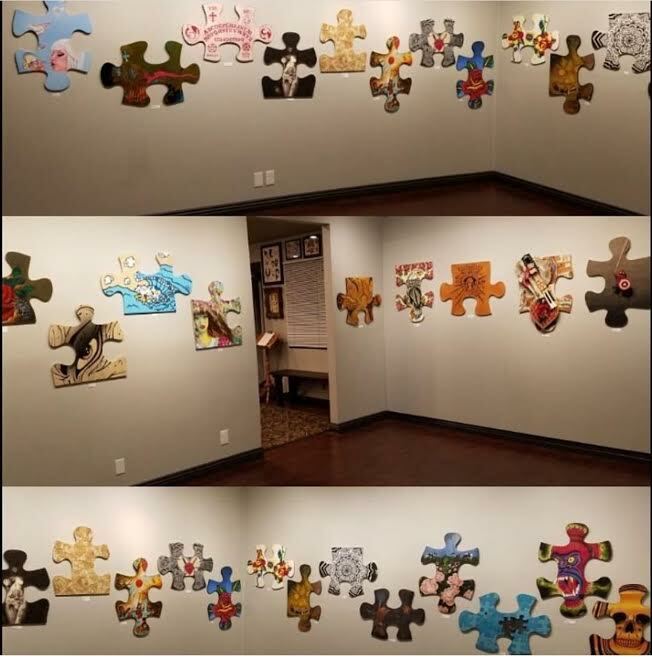 The concept for “Piece by Piece” was a dream of artist and curator, Tim Shelton for a long time. He had been wanting to create a show where the separate puzzle pieces would somehow come together. The results were amazing. Each piece was beautiful on its own, but when all the pieces were placed together into one cohesive piece, the result was awe-inspiring. 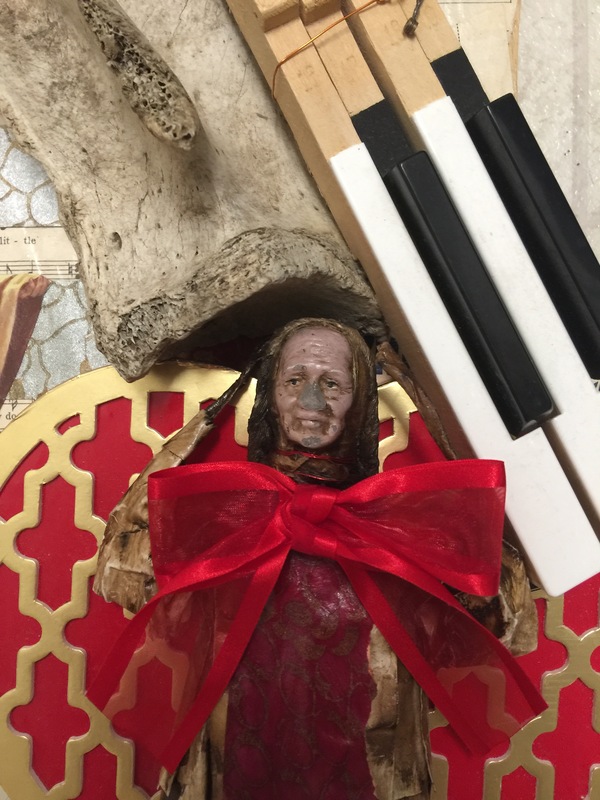 I was finally able to create a piece I had envisioned for quite sometime, utilizing large pieces of bone found on the beaches of Alaska, along with some old pieces of ephemera from Hawaii, guitar neck, piano keys, sheet music that I had been collecting for years. 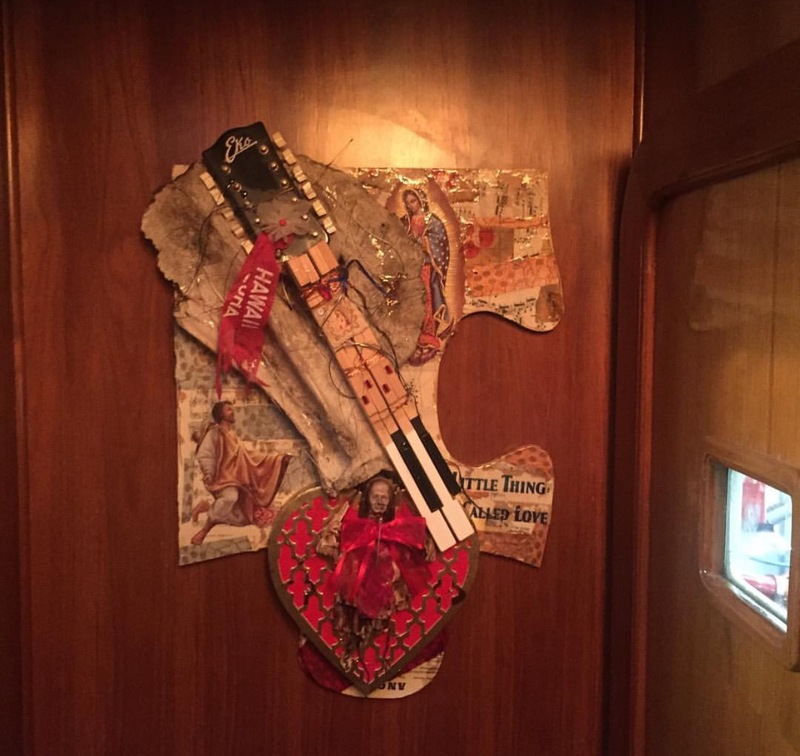 I named my piece “Sea Sick,” which was named after one of my favorite Morrissey songs, “Sea Sick, Yet Still Docked.” I had been inspired by a number of events that had been going on in my own personal life. My father had just been diagnosed with Stage IV cancer, and my world had flipped upside down. I had utilized found pieces from Alaska and Hawaii, which were the last two states added to the union. 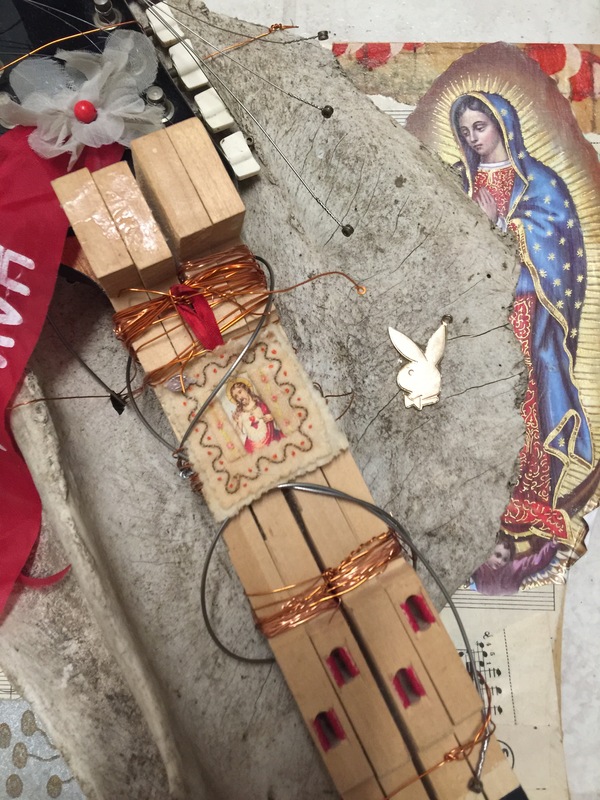 I wired pieces of an old guitar and piano keys using old coils from tattoo machines. I sealed the piece off with resin as to give it a “visceral/found in water” type of look. Most of the artwork sold, and proceeds were donated to Talk About Curing Autism, TACA. It was an honor to be able to participate in something that had so much meaning to so many people. Now “Sea Sick” is in the perfect home of an art collector. He now resides on a boat somewhere off the coast of California. Here is a link on the Time Lapse of the “Piece by Piece” show. As you can see, one person can do something beautiful, but many people coming together for a great cause can can be brilliant.